The idea behind Doctor Stranger was good, the writer just dropped the ball. It seemed, to me, like they kept writing just to make it longer. It wasn’t like the show NEEDED to be a full 20 episodes. In fact, I think it would have been better if it had been half as long. The drama begins with a heart surgeon and his son being taken to North Korea to stop him from testifying against a hospital in a malpractice law suit. The son, Hoon, grows up there, studying medicine, like his father. Because he has to practice medicine under difficult and sometimes horrible conditions, such as operating in the dark, he develops amazing surgical skills. In attempting to escape North Korea with his girlfriend, Jae-Hee, Hoon is separated from her. He is finally able to get to South Korea but doesn’t stop his efforts to find Jae-Hee. He eventually meets a doctor that looks exactly like his lost love. Who is she, really? Now let’s add in a little espionage, kidnapping, a crooked politician, an evil hospital chairman, a young man bent on revenge, a hospital worker willing to do ANYTHING to get ahead, and some romance. Sound good? Well, it’s good enough to keep you watching, but it’s too drawn out. There’s also a top political figure who has a bad heart and needs surgery to stay alive. Being who he is, he sets out to find the best surgeon to do it. With two amazing heart surgeons at the same hospital, the administration decides to have a competition to see which doctor gets to perform that important operation. This competition drags on for multiple episodes. Dr. A wins, but wait – how about the best two out of three, but wait – how about manipulating the situation so Dr. B can stay in the race, but wait – how about discovering that one patient in the competition doesn’t even need surgery at all, but wait – how about… It just goes on and on and on – changing the rules, changing the patients… It was just like the competitions in Baby Faced Beauty. It’s kind of like kids on a playground insisting on a “do over” because the result wasn’t what they were hoping for. Best 2 out of 3, best 3 out of 5, best 5 out of 7. Don’t you just hate bad losers? The bad guys in this show are really bad. There’s a scene close to the end where a man actually laughs one of those stereotypical evil-type laughs as he’s going on and on about how good it is for the strong to trample the weak. It’s almost like the wicked witch’s laugh in The Wizard of Oz. I just thought, “This man is completely insane.” It’s one of the best scenes in the drama and Cheon Ho-Jin’s acting is phenomenal. If you’ve seen the Kdrama Good Doctor (which is fantastic, by the way) you’ll definitely notice Doctor Stranger stole a very cool idea. In Good Doctor Park Shi-On has the talent to just think about what is wrong with a patient and picture the whole thing in his mind. There’s always a shot of what looks like the “inside” of the patient so the audience can see what it would look like in Shi-On’s mind. I thought that was a pretty neat concept. Evidently, so did the writers of Doctor Stranger because they do the exact same thing with Park Hoon. Not quite so cool when it’s not an original idea, though. Lee Jong-Suk, who plays Park Hoon, is a fantastic young actor. I loved him in I Can Hear Your Voice and he didn’t disappoint me in this, either. That guy is a master of expressions. Happy, sad, playful, serious, afraid… You name it, his face can portray it. Jin Se-Yeon’s performance, in my opinion, was sorely lacking. It seemed like all her scenes were just dress rehearsals. She’s been in eight different Kdramas, two movies, and one theater production so she must be a good actress. I just didn’t see it in her role as Song Jae-Hee. I’ve only seen Park Hae-Jin, whose character is Han Jae-Joon, play serious roles. One of his acting talents is being able to remain expressionless in all kinds of situations. (Quite the opposite of Lee Jong-Suk.) I’d like to see what Park Hae-Jin could do in a romantic comedy. Kang So-Ra, who plays Oh Soo-Hyun, is elegant and knows how to play the camera. She and Lee Jong-Suk have great chemistry. In spite of all the teasing, you could tell Hoon really respected Soo-Hyun and she was kind of in awe of him. Nothing really stood out about the music. There is one song that I didn’t really like, mostly because I didn’t care for the singer’s voice. Unfortunately, it played quite often. The drama was filmed in both South Korea and Hungary. We don’t get to see a lot of the Hungarian scenery, though. There’s a part where Hoon and Jae-Hee are on a motorcycle, being chased all over Budapest, and they end up on a bridge. That’s actually a pretty neat shot. I enjoy it when dramas take us new places, even if it’s just for a few minutes here and there. Hyeok Jin, the director of Master’s Sun and City Hunter, two great Kdramas, directed this show as well. He does a great job balancing close-ups and wide angle shots. And he really knows how to shoot action scenes. Too bad there wasn’t more action in this drama. This show didn’t do too badly in the ratings, averaging almost 12% nationwide. In China, the online streaming rights for Doctor Stranger were sold for $80,000 per episode! As of July 7, 2014 it had been streamed close to 400 million times! Since the drama is obviously so popular in China there are plans to edit it into a movie, give it an alternate ending, and release it in theaters exclusively in China. I think they ought to do that for the U.S. as well. It was way too long as a 20 hour Kdrama but I’ll bet it would make an awesome two hour movie. Doctor Stranger is a combination of a romantic drama, an espionage drama, and a medical drama all rolled into one. It’s a good show. However, if you’re looking for a love story, I Need Romance 3 is more romantic. If you’re in the mood for a North Korean spy drama, Spy Mung-Wol is more entertaining. And if you want a medical show, Good Doctor far outshines it. 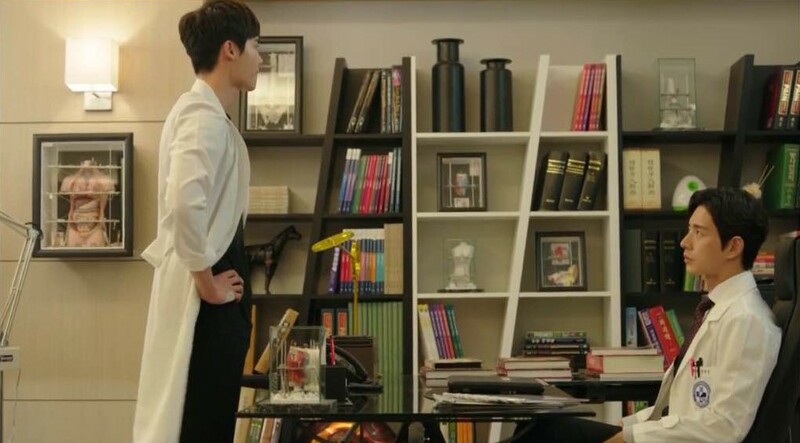 But if you’re putting those three different genres into one single drama, Doctor Stranger is the one to see.